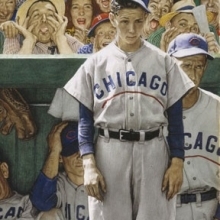 Rockwell traveled to Boston with Saturday Evening Post art editor Ken Stuart to photograph fans during a doubleheader between the Boston Braves and the visiting Chicago Cubs at Braves Field. Additional images taken in the studio were used to fill out the jeering crowd. 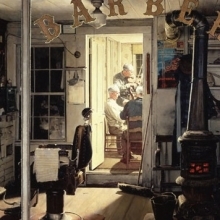 Rockwell himself can be found in the upper left corner of the painting. The artist typically used oil paints for his final work, but this is a rare example done in watercolor. 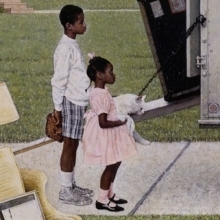 This illustration for an article on the changing racial profile of America’s suburbs offered Rockwell an opportunity to again feature children—favored subjects throughout his long career. Beginning in the late 1930s, Norman Rockwell adopted photography as a tool to bring his illustration ideas to life in studio sessions. Working as a director, Rockwell carefully staged his photographs, selecting props and locations, choosing his models, and orchestrating every detail. He created an abundance of photographs for each new subject, sometimes capturing complete compositions and other times combining separate pictures of individual elements. These photographs were the focus of a recently completed two-year project at the Norman Rockwell Museum that preserved and digitized almost 20,000 negatives. 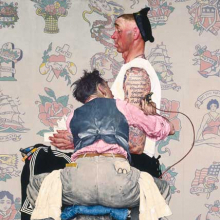 For the first time, Norman Rockwell: Behind the Camera presents these study photographs alongside his paintings, drawings, and related tear sheets to offer a fascinating look at the artist’s working process. 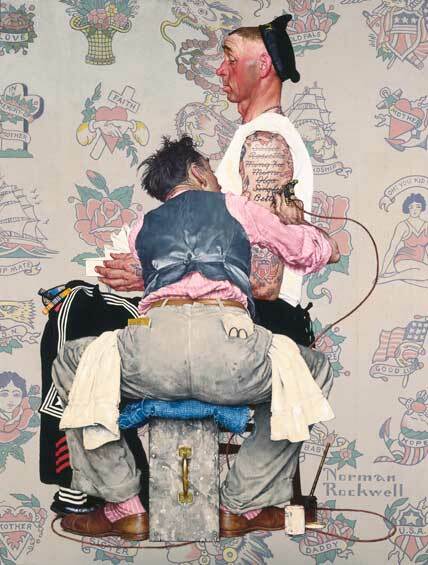 Norman Rockwell: Behind the Camera has been organized by the Norman Rockwell Museum in Stockbridge, Massachusetts, in collaboration with guest curator Ron Schick. The Brooklyn Museum presentation is organized by Sharon Matt Atkins, Managing Curator of Exhibitions. Additional support is provided by the Norman M. Feinberg Exhibition Fund.